Even for smaller companies, business relocation can be daunting. To reduce stress and streamline the process of moving, you have several viable options. In preparation for your upcoming relocation, these tips will make a significant difference. There are several reasons for relocating a business. Perhaps your current lease is up and you want to move to a different part of the city, your company may be experiencing an expansion, or you might be moving a home office to a brick-and-mortar location. Regardless, the following tips will ensure a quicker and more efficient move. Create a Plan – Before anything else, create a plan that includes a timeline. This will keep you and others on track for packing, changing utilities, ordering furniture and supplies, and so on. Having an established plan about four to five months ahead of the move is essential. Designate Resources – Take advantage of workers by delegating specific tasks. Especially for a larger business relocation, having support and assistance is imperative to a successful move. Hire a Professional Moving Company – Approximately three months out, identify at least three potential movers. Then two months from the move, hire the company that you want to handle the move. 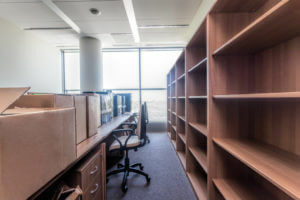 This is also the time to hire cleaners to prepare the new office, if required, but also come in after the move to clean the old office building. Send Out Notifications – As part of your business relocation plan, notifications need to go out to vendors, suppliers, customers/clients, banks, and other establishments. Typically, this should be done about one month prior to the move. Update Internal Information – With about two weeks left before the business relocation, your website needs to be updated, along with business cards, letterhead, etc. There are additional things to consider when organizing and planning a business relocation. For example, try to minimize travel time. In the last three months prior to moving, things will be more hectic than usual. Instead of doing a lot of traveling to meet with clients, vendors, and prospects, among others, take advantage of technology by conducting meetings online. This will free up a substantial amount of time, allowing you to focus more on things associated with the move. In addition, it is important to keep your workers’ morale up. Not only is a business relocation challenging for you, it can have a negative impact on employees. By maintaining high morale, business operations will go on as usual. Ultimately, your employees will be happy and productivity will remain high during the moving process.